Semantic interaction offers an intuitive communication mechanism between human users and complex statistical models. By shielding the users from manipulating model parameters, they focus instead on directly manipulating the spatialization, thus remaining in their cognitive zone. We present the concept of multi-model semantic interaction, where semantic interactions can be used to steer multiple models at multiple levels of data scale, enabling users to tackle big data problems. 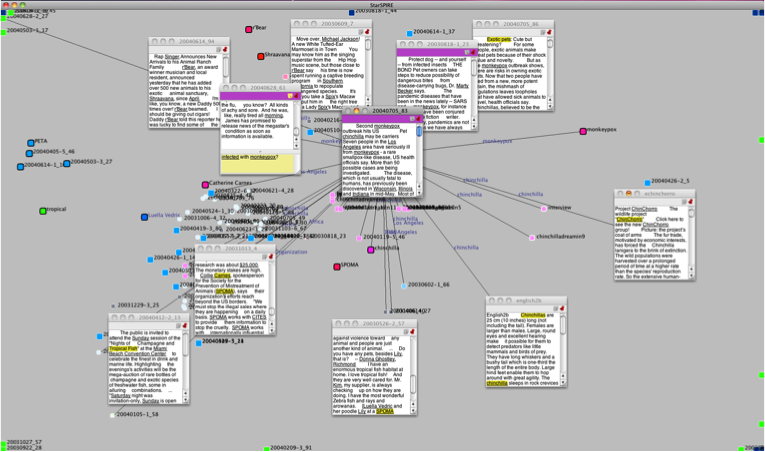 We also present an updated visualization pipeline model for generalized multi-model semantic interaction. To demonstrate multi-model semantic interaction, we introduce StarSpire, a visual text analytics prototype that transforms user interactions on documents into both small-scale display layout updates as well as large-scale relevancy-based document selection. Thus, as users interact in a large display space, the underlying learning algorithms guide: (1) information retrieval models to bring relevant text onto the screen and guide, and (2) dimension reduction models to layout the text on the screen. This supports both the foraging and synthesis portions of the sensemaking process. BigSpire extends StarSpire to use Bing or IEEExplore for foraging big text data.